There was a time when having a ‘Super’ suit was all anybody wanted. Anything made in a Super 120s wool, ideally Super 150s, even (whisper it) Super 200s, was considered simply the finest thing money could buy. Which in a way, it was. The wool fibres used in the making of the suit were extremely fine (that is, thin) and with every higher ‘super’ number, they got finer. Finer fibres, and the finer yarns they were spun into, created beautiful cloths. But they were also increasingly lightweight, which made them difficult to work with, often lack the body to hold a crease, and wear out quickly. Today the ‘fineness’ or quality of a cloth is treated more broadly, and takes in factors such as length of fibres, crimp, tensile strength and other factors. At the same time, sturdier, more traditional cloths have become increasingly fashionable. But where did this ‘super’ system come from, and who regulates it? This is the story of wool grading. Originally, wool grading was done by professional sorters who would sort the wool after shearing into different lots, according to how it felt to them in the hand and how it appeared to the eye. The soft and lustrous was thus separated from the coarse and dull. The former were from the part of sheep that was protected from elements and contamination, and there was generally less of it than the coarser grade. However, over time advances in selective breeding increased the proportion of higher grade wool. As the European textile industry grew and the demand for wool increased, it became necessary to grade wool fibres more accurately. At the time, all Australian wools were traded through the London market and an attempt was made by the British Wool Control (BWC) to classify the wool fibres into a number of categories. This classification was based more on the final use rather than characteristics such as colour, softness or crimp. There were four main grades, each divided into three sub-grades based on the length of the fibres, and in turn sub-divided based on a visual assessment of the fineness of the fibres. Numbers were allocated to the divisions ranging from 60s to 90s, with 90s being the highest grade designated for use in fine apparel. Another method of grading wool at the time was by blood. Using full-blooded or pure-breed merino sheep as the standard, other wools were divided into seven basic grades descending in quality and fineness. Each grade was meant to correspond to the fineness of count to which the fibres could be spun. These grades ran from 80s to 36s. It is likely that the two grading systems were combined in the term Super 100s, which was adopted by English weavers to refer to the best wool qualities available. But in spite of the various attempts to objectively measure and grade the wool, growers and buyers continued to rely on old visual and tactile methods. For a long time some English mills also used an unofficial system whereby the ‘super’ number related to the maximum worsted count of yarn to which that particular type of wool could be spun. As spinning and weaving technologies developed and the demand for finer yarns and lighter weight fabrics increased, it became increasingly important to have proper grading guidelines. So new technical parameters were established to grade wool by fineness measured in microns (1 micron = 0.001 mm), and this quickly became one of the most important factors in use. In 1970, the Australian Wool Corporation (no longer in existence) published a new chart which attempted to establish a relationship between the old classifications and micron count. Around this time, new developments in spinning began to make it possible to spin finer yarns from coarser wools, and cloth with counterfeit selvedges and misleading descriptions relating to quality of wool started to appear in the market. Wool growers also managed, by further selective breeding, to produce wools finer than ever. New terms such as Super 110s, Super 120s, Super 130s and so on – none of them recognised by any textile association – started being used by manufacturers. In order to bring some cohesion into the grading system, the National Wool Textile Export Corporation (a British Body) established in 1992 a quality designation based on microns with codes of practice that classified wool from Super 70s to Super 150s. This classification is based solely on the maximum mean fibre-diameter of tops, and does not consider the other characteristics of the wool fibres. Modern luxury cloths speak of more than just microns. They talk about the average length of fibre, of the crimp, and often other factors unrelated to quality, like sustainability. Because while there is a correlation between fineness and length (for example), not all Super 150s fibres have the same average length. And crimp is even less correlated – something demonstrated by Escorial cloth, which is not the finest in the world but certainly has the most crimp, giving it loads of natural stretch. A finer fibre is softer, making it feel luxurious; some, like Super 200s, can feel as soft as cashmere. But length is crucial: superfine wools can be spun into fine yarns because they are long as well as thin. Cashmere is a pretty stubby fibre by comparison. There is also more acceptance today of superfine wools that last better and hang better because they aren’t woven into such lightweight cloths. A higher-twist yarn or a denser weave can be used with a superfine wool to create something that feels almost as luxurious, but will last more than a week in the office. Superfines aren’t anywhere near as fashionable today as they were 10 years ago. But understanding what they are is also the process of understanding wool itself. And if you want a sleek, sharp suit, chances are you’ll end up going with something on the supers scale. You can follow the discussion on Superfines: The story of refining wool by entering your email address in the box below. You will then receive an email every time a new comment is added. These will also contain a link to a page where you can stop the alerts, and remove all of your related data from the site. Another academic piece that has no practical value at all. How would this impact your choice of cloth when visiting a tailor? Did you write this Simon? Thanks for your opinion, but many others have said how much they like this series. I do like your guide of cloth series , well organized and much informative than other similar article on internet. I particularly like the one talk about jacketing. The term – the “set” is something that I didn’t heard before. Who said everything has to have “practical value”? Anyway, I find it useful, also for practical purposes, do know what the superfine numbers mean and what they don’t mean. This article helps us understand our clothes better so we can make better choices when purchasing our suits. However, I don’t think there is quite enough in this article to explain the practical application of Superfine wools. 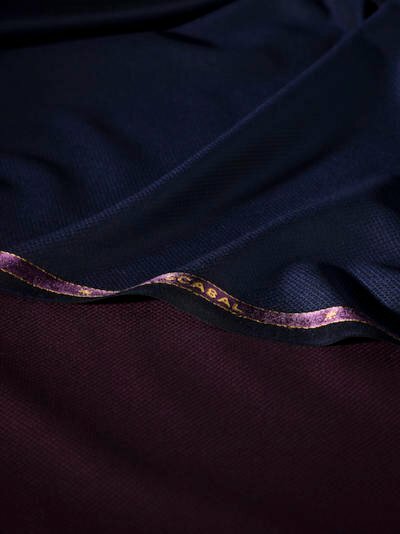 I like the design of the Scabal fabric on the photo very much. It is sad that there is no heavy version with such design. Zegna makes a similar design but it is also lightweight. How does all of this affect shine? Nothing in the entire world worse than shiny cloth. (and it can sometimes be hard to tell when on a roll). How do we avoid / what constitutes shine? Also, please find out why navy suits always seem to develop a ‘shine’. Shine is caused by having a flat surface that reflects light in a uniform way where as other surfaces reflect as much light but scatter it and so doesnt create the same effect. I have an Escorial navy suit made almost fifteen years ago and there is no “shine” at all, which is a trait of Escorial, partially due to the elliptical shape of the fibre (as opposed to the more cylindrical shape of other fine wools) this, along with its corkscrew form along its length (which gives its natural elasticity) results in a very different refraction of light. Do you think that superfine shirting material is just as impractical as it’s suiting equivalent?I wonder if there is much advantage choosing a Sea Island quality cotton over a say a 100 or 120 from reputable makers like T&A or H&K. What a very odd comment, by “anonymous”… Why would anyone presume that every post on a *blog* would meet their personal requirements? Very informative and useful information. I love articles like this and the one on silk a few weeks ago. Phooey on “Anonymous”‘s comment. Articles like these are big reasons why the readers of this blog return everyday and follow this guy’s stuff. How would you compare escorial to supers interms of holding a crease and durability? I quite like the idea of one or two garments made from “high supers”, (often a wool and cashmere mix) simply because it will have a softness which makes wearing it feel really special. The fact that it is likely to be more fragile than the more bulletproof workhorse cloths means that it shouldn’t be worn too often, which just adds to that special feel when you do. Some of us deeply appreciate your in-depth articles on different types of fabric. I refer some of my customers to your blog. And I appreciate being able to add to my knowledge base so that I can give better advice to the few customers who ask. So, please, carry on and if someone doesn’t like your articles, they should just “change the channel.” Thanks again for all your hard work. Whilst we pursue the best ‘feeling’ cloth for our suits isn’t it ironic that the cloth , particularly on a jacket , never touch our skin! Undoubtedly the feel of movement is different in cotton as opposed to wool . Furthermore the beneficiaries of the fineness and smoothness are those we ‘rub’ against. So how much premium should we place in the ‘feel’ of a cloth? The hand makes a big difference to my girlfriend, who loves it when I wear woolen flannel or camel hair. But no lightweight Super 150s suits for me. Super 110s (lightweight or heavy) does me just fine. I agree with the consensus. Whilst accepting it may not be for all, as a scientist and general nerd, I find these articles iterating the technicalities of the trade fascinating. Keep it up Mr. Crompton. Thanks for this very interesting post! To me, it has a practical implication when it comes to building up one’s wardrobe. Obviously, it wouldn’t make sense starting it with jackets or suits made of super number cloths. Presumably, counterfeit and misleading descriptions of cloths might become a very serious problem. Is there any strategy that could help protect consumers? For me I find the 14 micron fibers to have the most luxurious feel. I have not found suits made with such fiber to wrinkle excessively. Indeed, Kiton claims that their 14 micron fabric suit resists wrinkles. Can you explain why the usual argument is that high super number fabrics tend to wrinkle. Is Kiton or Zegna doing something different with their 14 micron wool that prevents wrinkles? Fineness is only one aspect of cloth, and the other things mentioned here – staple length, twist, and weave – could all help them not wrinkle. I think the comment by anonymous served a valuable purpose. It galvanised people like me who would normally never bother to add a comment to give some feedback. I have to say find these articles very interesting. Some of the information in them will have a practical use for me personally; other information probably won’t, but nevertheless I enjoy reading it. You can’t please all of the people all of the time; but the general excellence of the site and the information on it is beyond doubt. I’m sorry to have missed the Sartoria Formosa visit to the shop – is there anywhere in the UK that sells their suits or do you have to make the trip to Naples or No Man Walks Alone? Hi Simon, if I’m selecting a fabric for its formality as well as durability (lots of business travel), what do you recommend? I’ve usually gone for 11-12 oz, worsted, super 110-120s just out of habit, usually VBC, but I’ve been splurging a little more on the likes of scabal/dormeuil now. More expensive fabrics will likely be finer, and not help you with either formality or durability. They may actively harm the latter. I’d stay with what you’re already getting, maybe upping the weight to more like 13-14 ounce. Hi Simon, do you know how much water is used in the process of making a suit? My next port of call will be the Woolmark company, but thought if anyone might know then you might. Super numbers do not measure finesse and are largely irrelevant as they measure the fiber length, regardless of the width all along the fiber and therefore ignore durability. Instead he believes that the micron numbers are more relevant. So do a good vs bad super150 have same finesse but different length or the other way round? It’s all in here, but not necessarily set out clearly. – Today, as I said in the piece, the word ‘fineness’ is often used to mean just the best fibre, and that is obviously a combination of all these measurements. Hey simon, I purchased a Vbc s130 wool hopsack navy sportscoats from the armoury some time back and it had a shine to it that made it quite formal and perhaps not so suitable with informal trousers like khakis. However after some time I noticed that it seems to have lost the shine. Is that the case with super wools?